The Magic of Flight represents another in the long series of IMAX films designed to educate and entertain at the same time. Considering the fact that most IMAX theatres are housed within museums, it stands to reason most of these films are of a more technical and scientific nature. When I first got into DVD, I was pleasantly surprised that it seemed to be the only medium that regularly saw home versions of IMAX movies. Running around 40 minutes, the film is a two-fold experience. On the one hand, the movie is about the famous naval aviators, The Blue Angels. On the other, it's about the history of flight and the science behind it. Narrated by Tom Selleck, Magic of Flight gives an overview of the training required to not only be a successful Navy pilot in general, but to be part of the precision Blue Angel team. Being an IMAX film, the movie was designed to give a motion experience to viewers. Cameras are attached to planes in interesting places, and the resulting footage is astounding. Obviously the effect isn't the same at home, but the cinematography can easily be appreciated. The documentary about the Blue Angels is interspersed with interviews with pilots as well as historical information on the origins of modern flight. There is a great deal of technical detail as well. If you never knew much about the technique or science behind planes, there's more than enough material here with which to fill up your brain. It is obvious that the filmmakers put enormous effort into the movie, on top of which, the photography is achingly beautiful as well. One of the minor elements that did make me laugh, though, is how all of the designating marks on planes and ships have been apparently digitally removed. Now that's what I call secrecy. Initially, I was put off by the presentation of the material in the movie. I thought it dumbed-down the topics a little too much and that the narration was just plain dumb. I mean, do I really need Tom Selleck saying things like, "You have to be careful to fly a plane," to appreciate the footage? After a while though, I considered how clean these films have to be, for lack of a better term. IMAX movies tend to err on the side of caution, rather than try to be artistic masterworks. In fact, the most extreme, serious thing I've ever seen in one of these educational IMAX works was a pair of lions mating. By having such a base-level presentation, Magic of Flight can now easily be appreciated by almost anyone and especially children. Image Transfer Review: As the package denotes, Magic of Flight was originally an IMAX format film, designed for those huge screens. While there is no loss of image in the home theater format (IMAX is technically 1:33:1), there is the loss of experience. Good IMAX theatres wrap the audience in a huge, domelike screen that induce feelings like motion sickness and dizziness. At home, the effect is not as impressive, but that can't be helped. The image is easily one of the best full-screen images I've ever seen. The sharpness, color balance, and clarity are extremely impressive. The film runs between 8-10mbps all the way through, as well. The only flaws are the amount of negative spots and scratches in certain areas and some minor compression artifacts that pop up in a few places. Be assured however, the issues are nothing compared to the top-notch video throughout, from the amazing opening of a sunset over a swamp, to the Blue Angels performing their aerial stunts. Viewers must also keep in mind that true IMAX photography uses slightly fish-eyed lenses, so much of the film has that effect applied to it. The packaging states that the Making-of documentary was shot in High Definition. I'm unsure of the technical details (since none are given), but regardless, the image quality in the documentary is outstanding. Easily 'A' quality. In fact, the scary thing is that footage from the actual film almost looks even better here. The high definition segments appear to be only interviews with the filmmakers, but regardless the mastering on this documentary is jaw-dropping at certain points. Audio Transfer Review: Like many IMAX films, this one has a great soundtrack. In a film with lots of jet plane action, you'd expect seat-rocking audio, and Magic delivers it. The Dolby 5.1 soundtrack is extremely high-quality. Crisp dialogue elements, fantastic surround sound, and kicking bass are all found here. Whenever there's good plane action, there's good sound. Otherwise, the sound is fairly average (since it's just narration or interview dialogue), but that's not really the point here. You'll want to crank your system during the aircraft carrier take-offs to get a real thrill. My only complaint is the awful, pseudo-country/western music soundtrack that tends to get in the way of a few scenes. Otherwise, this soundtrack really scores when it counts. The film also has a DTS 5.1 audio track, however I am not able to critique this as I do not use a DTS setup. If the Dolby Digital track is any indication though, the DTS should be kickass. Extras Review: The disc is thin on extras, but it does have a Making-Of documentary that is roughly the same length as the film itself. The film has amazing video quality (which I've already touched upon) and is very informative. In some ways, I found the documentary more interesting than the movie itself. What makes the documentary special is the exploration of IMAX filmmaking, which is a mysterious process to most people. Also of interest is the manufacturing of special camera mounts to be used on the Blue Angel planes. 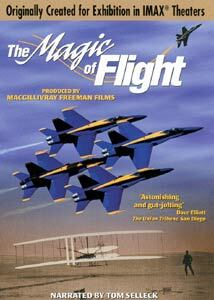 There are trailers for other IMAX films on DVD, as well as the trailer for Magic of Flight itself. There is a short bio on the director with a filmography, but nothing else on any of the other crew members. The "Do It Yourself Science Experiment" is an instructional piece on how to use a sheet of paper to demonstrate the science of vertical lift planes like the Harrier Jet. Magic's scene access setup is weak. There only 12 chapter stops available from the menus, despite the fact the film has 33 stops. The documentary also has 33 chapter stops, but it doesn't even get it's own menu. Instead, a different icon is used to access chapters from the same menu as the chapters for the regular movie. This was a bad idea since it means there's no chapter descriptions at all for the documentary. Overall though, this fact does not detract from the major benefit of having this lengthy and incredibly well made documentary. Magic provides a very family-safe, educational look at the world of flight. The amazing camerawork and visuals make it far more interesting and exciting than something very over-technical or complex. Undoubtedly, some people might find the movie a little simplistic. It does tend to talk down to the audience, and some of the educational material might seem weak to someone who knows anything about planes. It's hard to take these flaws too seriously though, considering the venue these films play in. Occasionally, I go and watch an IMAX film at my local natural history museum, and Magic of Flight is about equal to what you would usually find. Something exciting enough to freak people out in the theatre (thanks to the giant-screen effect), but also something that will fit the setting and please all ages. Recommended.